Intrigue ahead of Trump, Putin first meeting – Royal Times of Nigeria. US President Donald Trump, who recently suggested that bilateral relations with Russia were at an “all-time low,” plans to meet with Russian counterpart Vladimir Putin for the first time next week at the Group of 20 summit in the German city of Hamburg. The one-on-one meeting has been one of the most anticipated of Trump’s presidency after he offered conciliatory gestures toward Russia during the presidential campaign. But it comes as US-Russian relations have deteriorated further in recent months amid claims over Russian interference in the 2016 election as well as over disagreements on Syria and Ukraine. “There are so many disagreements that the agenda for the meeting has to be huge,” said Pavel Sharikov of the Institute for US and Canadian Studies in Moscow. 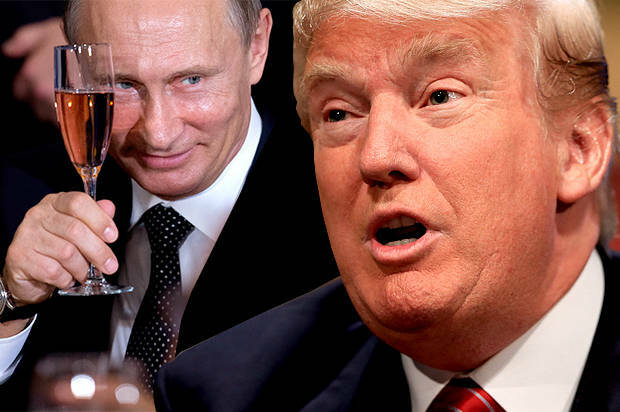 Foreign policy observers had predicted a possible shift in US-Russian relations under Trump, who had expressed personal respect for Putin as a leader during his presidential campaign and pledged to rebuild bilateral ties frayed over geopolitical conflicts in recent years. Putin was one of the first world leaders to congratulate Trump on winning the November election. The optimism of a detente has been stymied by allegations that Russian hackers committed cyberattacks to influence the US presidential election in Trump’s favour, creating a political environment in which it would be difficult for Trump to cozy up with Putin and adding to already tense relations. An on-going US investigation into Russian meddling in the election is also focused on possible collusion between Trump’s election campaign team and Russian officials. “The reason that president Obama did nothing about Russia after being notified by the CIA of meddling is that he expected Clinton would win,” Trump said on Twitter. Russia’s alleged interference in the American election has “become one of the most prominent cards played in US domestic politics by Trump’s critics seeking to undermine the legitimacy of his presidency,” Russian political and security expert Nabi Abdullaev told dpa. “The US president has had very little leeway to pursue any non-confrontational Russia policy. But it is worth noting that at least on a rhetorical level he still avoids attacking Russia and Putin personally, despite the fact that some members of his administration do it,” said Abdullaev, associate director for Russia at the global consultancy Control Risks Group. Russia last month cancelled planned talks between top diplomats in St Petersburg as a protest of a US move to expand sanctions imposed for the past three years in retaliation for Russia annexing part of neighbouring Ukraine. The spat was the latest in a series of incidents that has put on ice any opportunity Trump may have had to turn the page with Russia after years of deteriorating relations under Obama’s administration. Russia and the US have sparred over Syria, with Moscow threatening to down US and coalition aircraft after a US fighter jet shot down a Syrian warplane. Russia has faced stark criticism from Trump’s administration for its backing of the Syrian regime, while the US is backing anti-regime, anti-Islamic State forces. Trump’s decision to conduct a cruise missile strike on a Syrian airfield in April was seen as a provocation in Moscow. Expectations for Trump’s meeting with Putin during the July 7-8 summit are constrained given the extent of disagreements between the great powers. “It is most likely that it will be a so-called protocol event during which the leaders will go over the customary agenda of US-Russian relations, which was traditionally heavy on global security but light on business. We don’t expect any commitments to be made or demanded,” he said.